Hearing that Link may not have been able to leave the castle is quite surprising. Was one reason you thought about making Ganon’s Castle the only setting because early on in development you didn’t think you would be able to create a huge area like Hyrule Field? Yes. I thought so from the perspective of the hardware’s processing abilities while making Super Mario 64. At first, I didn’t mind making the game complete within a single building as long as I got to make Link in 3D. In other words, it might have turned out like Zelda II: The Adventure of Link.6 6Zelda II: The Adventure of Link: An action-adventure game released for the Family Computer Disk System in Japan in January 1987. 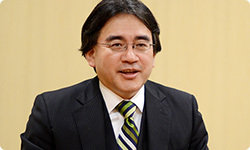 Koizumi-san did say that you were experimenting with a polygon The Adventure of Link for the Super Famicom system. That’s right. Partially because of that, I started making it with the idea that Ganon’s Castle might be enough. For example, there’s a room in which you fight Phantom Ganon after he rides a horse out of a picture. Yes. The boss battle in the Forest Temple. Oh, okay. Now that you mention it, I can see that. Because the fight against Phantom Ganon unfolds inside a room. By the way, one early task was chanbara-style (theatrical Japanese style) sword-fighting. (Toru) Osawa-san told me that. That’s right. I wondered if we could have one-on-one battles and started thinking up fragments like the battle against Phantom Ganon early on in development, and I tested controls for having Link swing his sword in different directions. You were making the game as if putting together a puzzle. Yeah. And as we were making it, we were able to have Link walk across a broad landform like a grassland. Did you make that broad landform because you wanted Link to ride a horse? We started by testing whether we could have two horses out at once. We thought if we could do that, then we could make other forms of play for that grassland. It went well, so we made a demo video with two horses. We showed that at Nintendo Space World7, and I said, “Now that we’ve shown this, there’s no backing out!” (laughs) 7Nintendo Space World: A video game trade show (in Japan) once held by Nintendo. The demo video with two horses for The Legend of Zelda: Ocarina of Time was shown at Nintendo Space World 1997. Also, you were the one who really wanted to show Young Link, right? But when I saw Adult Link that Koizumi-san had made, it was cool, but I said, “I don’t want to make this without Young Link!” Then we tested whether we could use both Adult and Young Link. 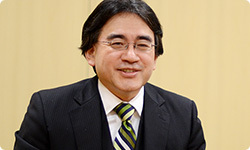 Koizumi-san tinkered with the system and you were able to use Adult Link’s motions for Young Link as well. That’s right. Thanks to that, we could also have Young Link. Why were you so persistent on Young Link? Link is a boy. In the first game, The Legend of Zelda8, he was about 12 years old. In Zelda II: The Adventure of Link, he was about 16, but I never wanted to make him just another cool hero. Until The Legend of Zelda: Ocarina of Time, Link was a playful and childish character. 8The Legend of Zelda: An action-adventure game released simultaneously with the Family Computer Disk System in Japan in February 1986. That’s right. (laughs) But I had worked on all the games since the first one, and I thought that if we made him too cool, he wouldn’t be Link anymore. On the other hand, I did want Link to be somewhat cool, so we decided to have both Adult and Young Link. He doesn’t just grow from the point of view of stats - as in an RPG - but actually grows up in appearance. When we did that, then all sorts of ideas bubbled up. More ideas sprang up than when you had just been basing the game around Adult Link. Yes. When we decided to handle Link growing up from a 9-year-old child to a more mature 16-year-old, I wanted lots of characters to fulfil various roles. For example, Kaepora Gaebora is a grandfather figure who gives Link all kinds of advice and looks out for him. And since Link is a boy, I wanted girls besides Princess Zelda to show up. And that’s why Saria and Malon are there. Right. Also, Link’s arch-enemy is Ganon, so I thought they should meet once when he’s a child. So there’s that scene at the beginning where Link has a nightmare. Yes. That connects to the courtyard scene. The innocent eyes of a child are able to see through to the truth, so Young Link knows instinctively that Ganon is a bad guy. When Adult Link meets him again, and Ganon says he’s that boy from years before, it really hits you. You think to yourself, “That’s right. I’m that child from before.” Putting in that scene was really fun for me. You make games based around functions, so you don’t often talk about story or dramatic interpretation, but I feel like The Legend of Zelda: Ocarina of Time may have been an exception. But while making it, I noticed that I didn’t want to tell a story so much as I wanted to have a lot of people appear around the main character and portray their relationships. Some years back, a television show called Twin Peaks9 was popular. When I saw that, the most interesting thing wasn’t the ins and outs of the story, but which types of characters appeared. 9Twin Peaks: A television series broadcast in America from 1990 to 1991. It was broadcast in Japan in 1991. Oh, (Takashi) Tezuka-san said the same thing in our session of “Iwata Asks” over The Legend of Zelda: Spirit Tracks.10 10The Legend of Zelda: Spirit Tracks: An action-adventure game released for the Nintendo DS system in December 2009. 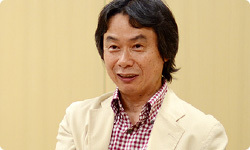 Tezuka-san told the staff of The Legend of Zelda: Link’s Awakening11 that he wanted them to have a bunch of suspicious characters appear like in Twin Peaks. 11The Legend of Zelda: Link’s Awakening: The first game in the Legend of Zelda series for the Game Boy system released in Japan in June 1993. In December 1998, the remake The Legend of Zelda: Link's Awakening DX was released in Japan for the Game Boy Color system. The Legend of Zelda: Link's Awakening DX became available for download from Nintendo eShop in Europe on June 8, 2011. That’s right. I think those suspicious and odd characters alone are interesting. I’m more interested in their presence than who is whose cousin and whose parents were sworn enemies in years gone by. Right. What’s important is what role that person plays and how they contribute to portraying the main character. Yes. You don’t want to tell a story so much as you have an interest in how the characters in their roles function to present the main character. It’s like you to think about a game from the point of view of how things function. Osawa-san, the script director, made lots of suggestions to me saying, “How about a character that functions like this?” Koizumi-san and (Yoshiki) Haruhana-san quickly designed those characters’ visible forms, and I helped make them too. So even when it comes to the Ocarina of Time, I hardly ever talked about the story. (Eiji) Aonuma-san said the same thing. He said that while a lot of people say they like the epic story, on the level of the script, the story isn’t actually that epic. It feels epic because everything you experience within the game is added to the story. That’s right. The experience players have encountering people in the game world builds up and comes to feel like a story. Grappling with the puzzles is another kind of experience.